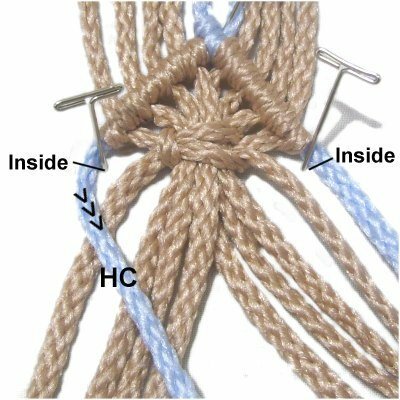 Description: Vintage Diamonds are the most frequently used Half Hitch patterns used in Macrame projects. You create diagonal rows of Double Half Hitches to make the top and bottom edges of the diamond. The design in the center can be made using various techniques. On this page are three of the most common designs suitable for the center area. 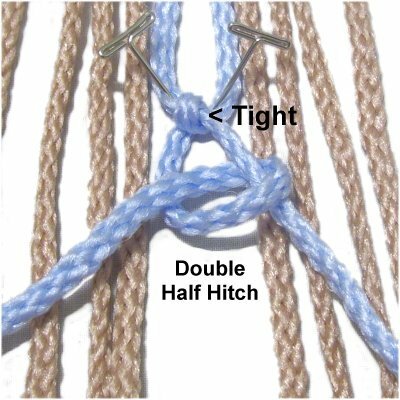 Make sure you know how to tie Double Half Hitches arranged diagonally. Click on the link or image to visit that page now. Also be sure you know the difference between holding and working cords. Another page you should visit is Unique Diamonds. The interior of the diamonds is handled in unusual ways, so be sure to practice those, too. When you make ALL the Vintage Diamonds on this page, you start by creating the top portion, as described in the following steps. In the example shown below, a different color was used for the two holding cords (light blue), to make learning easier. Step 1: Secure the holding cords vertically to a project board. On each side, secure 4 working cords. Mentally number the cords 1 - 10. Cross holding cord 5 over cord 6, heading right. Secure it closer to the front of your board (with tension). 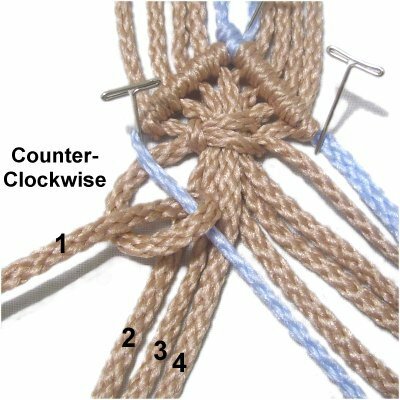 Step 2: Attach cord 6 to holding cord 5 with a Half Hitch, rotating counter-clockwise. 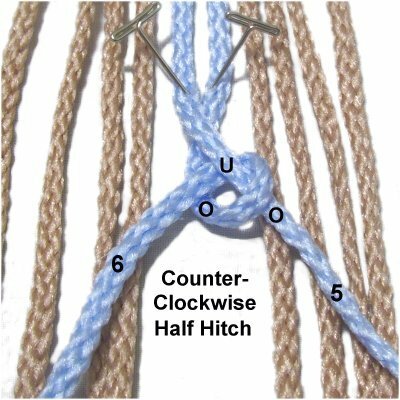 A Half Hitch is a loop that passes over - under the holding cord. As you pull the cord left, pass over to complete the loop. 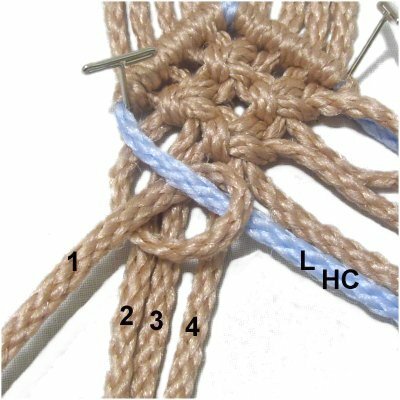 Tighten the first Half Hitch firmly, then tie a second Half Hitch to the right of the first. 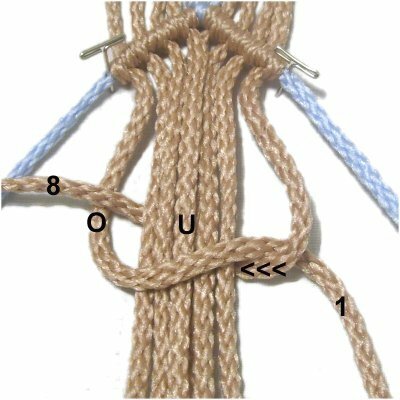 Make sure the first loop does not loosen as you tighten the second knot. 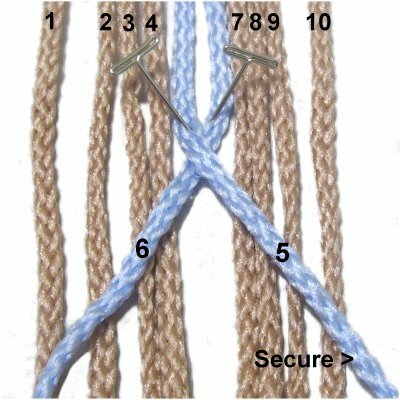 Step 3: Secure BOTH holding cords with lots of tension, so the rows you will be making are straight. The angle of the holding cords determines the shape of Vintage Diamonds, so adjust each one until you are satisfied with the shape and width. Attach cords 7 - 10 to holding cord 5 with DHH, rotating counter-clockwise. 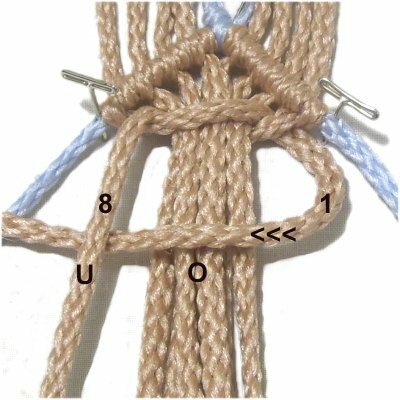 Make sure the knots are well tightened and neatly arranged without overlapping (see next image). Step 4: Attach cords 4 - 1 to holding cord 6 with DHH, in that order. 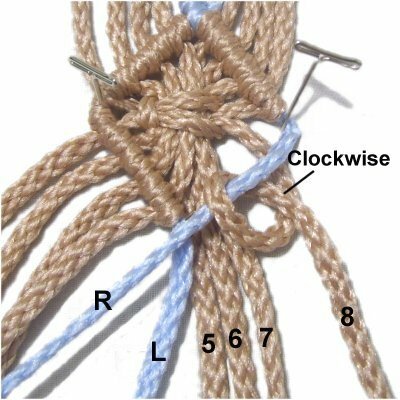 The knots should be tied clockwise, since you are moving right to left. Holding cords 5 and 6 are not used for the center area, so keep them secured. Place pins next to the first and last DHH, so the top portion is stable and can't move. After you complete the top area, you will need to decide how to decorate the inside of your Vintage Diamonds. Below are three common techniques you can use for the center area. 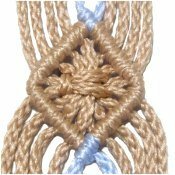 The first two are Square Knot patterns, and one is made with the Vertical Larks Head knot. 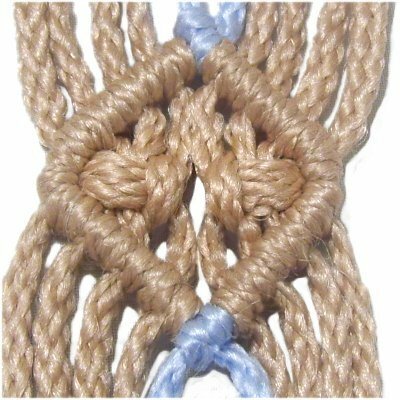 Other knots can be used, so be sure to EXPERIMENT to see what works for your project. 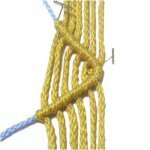 The key is to find a knot or pattern that is small enough to fit the size you are making. The larger you make the diamonds, the more options you will have. 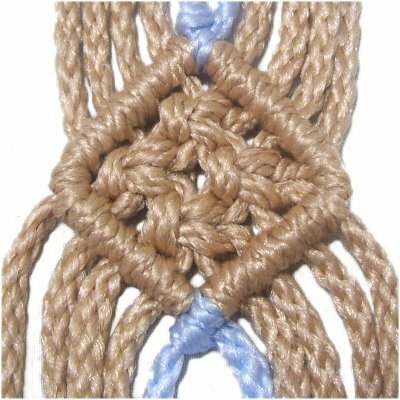 Description: The Square Knot technique is the most common variation you will find in Macrame patterns. Follow steps 1 - 4 above to create the Top Portion of the diamond. Mentally number the working cords 1 - 8. 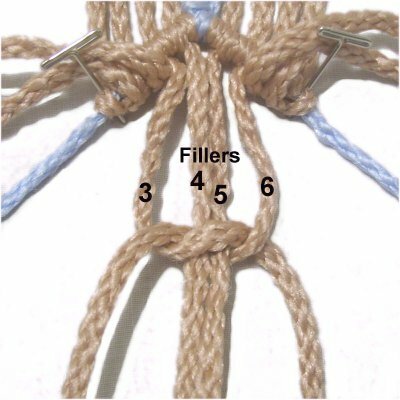 Move cord 1 to the right, passing over the fillers (2 - 7) and under cord 8. Step 2: Move cord 8 under the fillers, and over cord 1, as you pull it out on the the left. Tighten the first half of the SK so it lines up with the pins placed on the corners of the top portion (see next image). Step 3: The second half of the SK is tied in reverse direction, since the working cords have changed places. Move cord 1 over the fillers and under cord 1, heading left. Step 4: Bring cord 8 under the fillers and over cord 1, as you pull it out on the right. 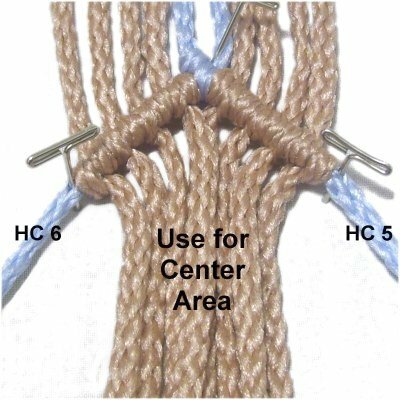 Tighten and adjust both halves of the Square Knot until you like how it fits. Designer's Tip: Vintage Diamonds can end up with rounded corners, especially with materials more than 2mm thick. When using 4mm or 6mm cord material, move the pins so they are on the inside, next to the holding cords (shown below). This way the holding cords pass around them to form the corners, giving them better angles. Step 5: Move the left holding cord towards the center and secure it with tension. Try to match the diagonal slant of the right upper row of DHH. Step 6: Attach cords 1 - 4 to the holding cord with DHH, rotating counter-clockwise. Tighten firmly and evenly so the row is neat. Step 7: Move the right holding cord towards the center and secure it. Try to match the slant of the left upper row of DHH. Attach working cords 8 - 5 to it with clockwise DHH, in that order. Vintage Diamonds are usually closed by attaching one holding cord to the other. In this case, attach the holding cord from the left onto the right. Designer's Tip: Are you using the same cords to practice all the Vintage Diamonds on this page? 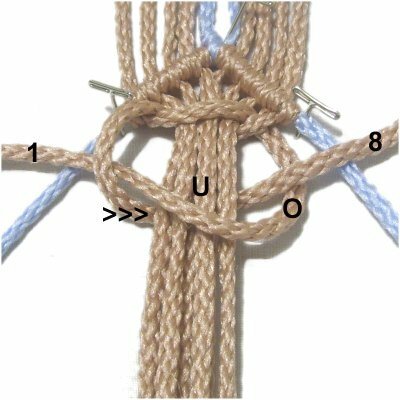 You can remove the lower rows of DHH by untying the DHH made with the holding cords in the last step. Pull the holding cords out of the DHH (at the corners). 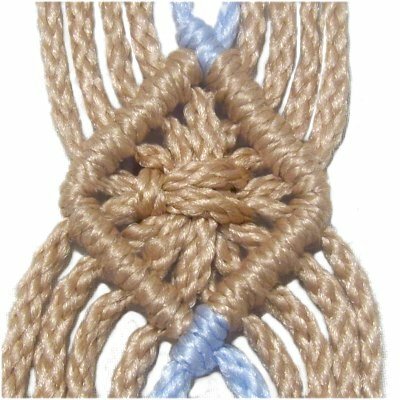 Then remove the knots or other design in the center, and you will be ready to practice the next technique. Description: This is another common technique for filling the center of Vintage Diamonds. 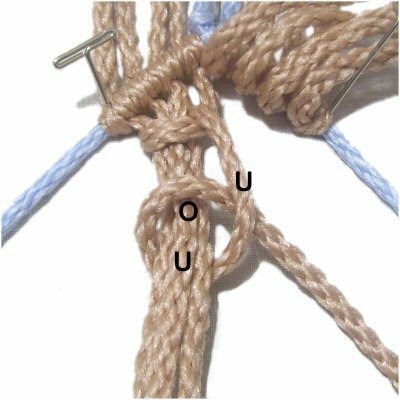 You tie four Alternating Square knots rather than one SK. Step 1: Create the Top Portion of the diamond following the steps described in that section. Keep the holding cords secured to you board afterward. Mentally number just the working cords 1 - 8. 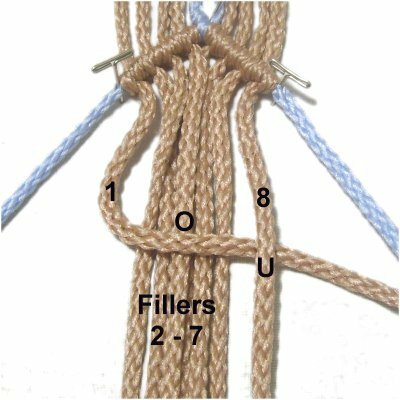 Tie a left Square Knot with cords 3 and 6, around the fillers, which are cords 4 and 5. Tighten it firmly, making sure it rests near the top of the diamond. Step 2: Tie a left SK with cords 1 - 4. Tie another SK with cords 5 - 8. You can make it a left or right SK. 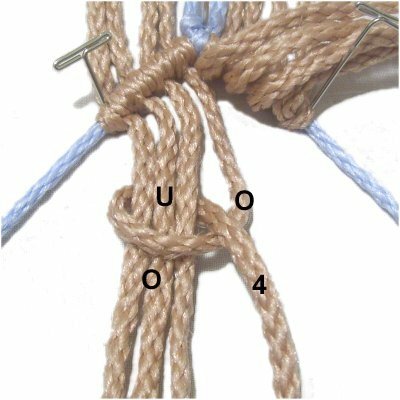 Both knots should rest in front of the SK from the previous step. Step 3: Tie the last left SK with cords 3 - 6, which will also rest in front of the SK from step 1. Step 4: Move the left holding cord towards the center, close to the left edge of the SK design. Attach cords 1 - 4 to the holding cord with DHH, rotating counter-clockwise. Step 5: Move the right holding cord to the center, near the right edge of the SK design. 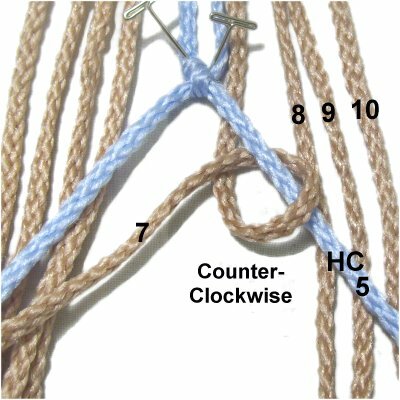 Attach cords 8 - 5 (in that order) with clockwise DHH. 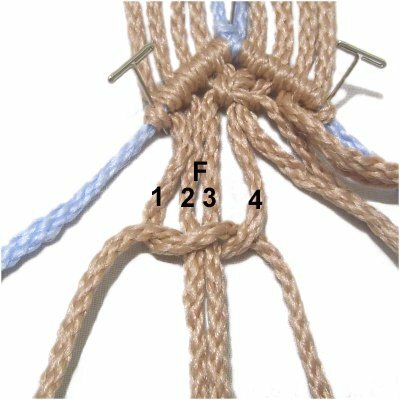 Attach the left holding cord as well, to close the diamond. Description: Here's another interesting technique you can use for the inside of Vintage Diamonds. Start by making the Top Portion of the diamond. Mentally number the working cords 1 - 8. 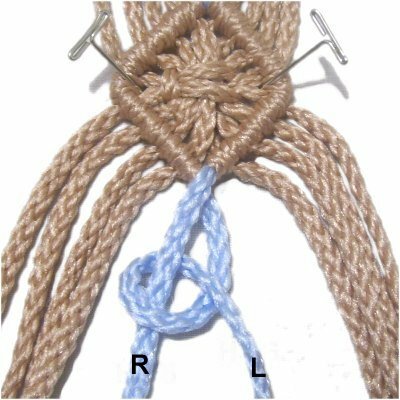 Step 1: To make the first half of the Larks Head knot on the left, use working cord 4. 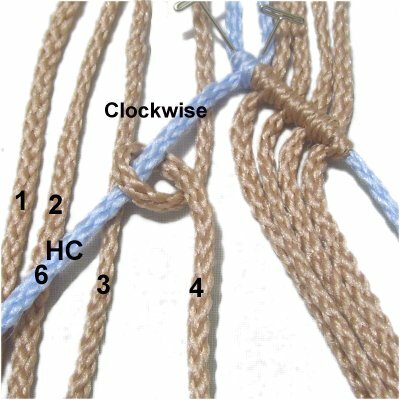 Make a clockwise loop over - under cords 1 - 3. As you pull the end right, pass over cord 4. 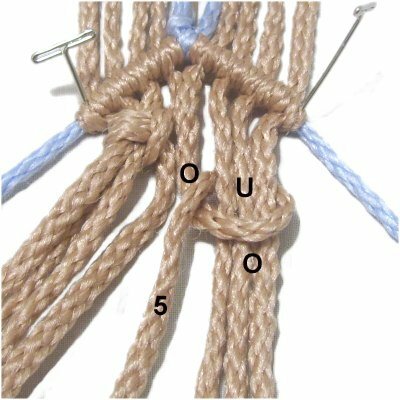 Step 2: To complete the Larks Head knot, make another loop with cord 4, passing under - over cords 1 - 3. 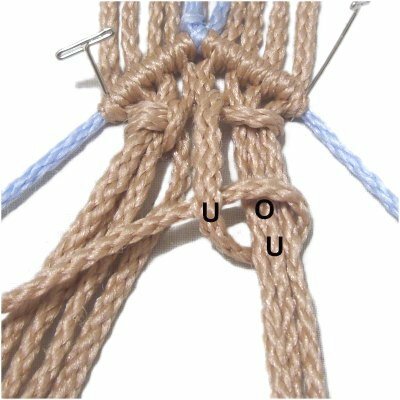 As you pull the end right, pass under cord 4. 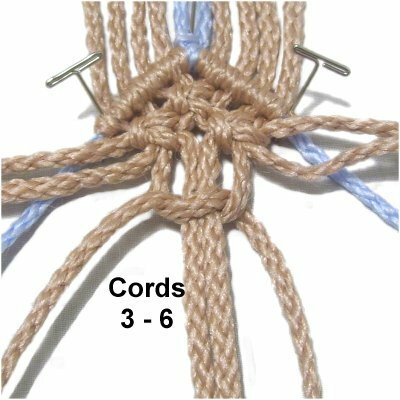 Step 3: Repeat step 1 on the right, using working cord 5 to tie the first half of the Larks Head knot around cords 6 - 8. 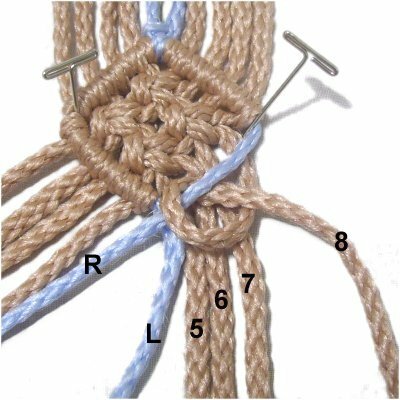 Step 4: Repeat step 2, tying the second half of the Larks Head knot. Designer's Tip: Vintage Diamonds look better if they are symmetrical, especially on the inside. So check to see if both Larks Head knots are lined up, and are the same size. Make adjustments before moving on. Step 4: Complete the diamond by attaching working cords 1 - 4 to the left holding cord with DHH, rotating counter-clockwise. Attach cords 8 - 5 to the right holding cord DHH, rotating clockwise. Also attach the left holding cord to close the diamond. Have any comments about Vintage Diamonds? Contact Me.